Half (1 002) of the 1 939 urban agglomerations in West Africa are considered to be rural clusters. Towns and cities in this group have an average city size of 20 000 inhabitants. Despite their small size, rural clusters have a relatively high market potential – total population living in the region of the agglomeration - implying that they are located in areas with high rural densities, for example within the main agricultural production areas of Benin, Côte d’Ivoire and Ghana. Their average local dominance (the measure of the size of an agglomeration relative to the size of other agglomerations in the region) is low, which combined with their high market potential and small city size, highlights the particular tendency of these agglomerations to cluster together. The large number of agglomerations in this group can be linked to the process of in situ urbanisation, or the transformation of rural settlements into urban or quasi-urban settlements, a key characteristic of the urbanisation dynamic and the emergence of new agglomerations in West Africa. 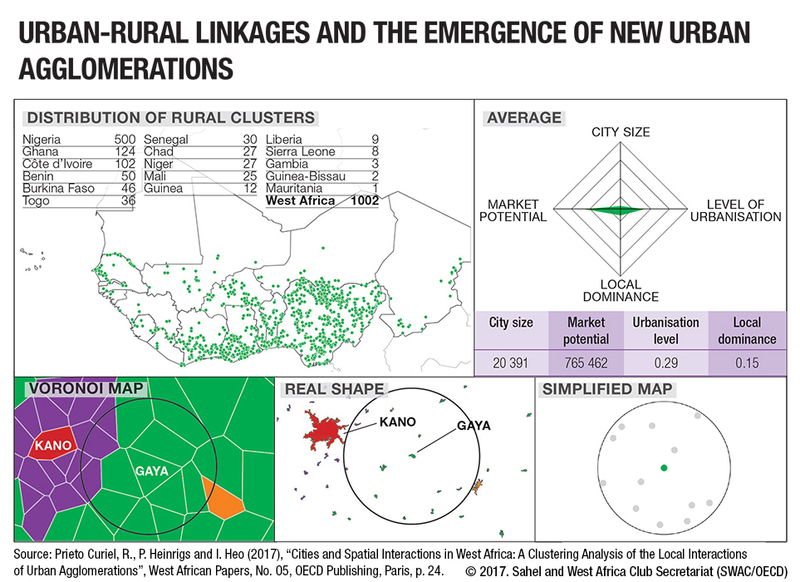 Of the 566 new urban agglomerations that ‘emerged’ in the ten years between 2000 and 2010, two-thirds (375) are rural clusters. These new towns are a key feature of urban-rural linkages, driving territorial transformation processes and acting as entry points to the food system for the vast majority of the region’s family farms.